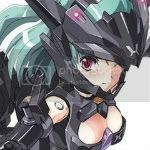 "A 5th anniversary commemoration book with complete guide of "Busou Shinki"! It comes with a bonus of original download code ('comic Busou Shinki 2037 style petite machines) is inserted!" Now I'm wondering, whats 'comic Busou shinki 2037 style petite machines? 'Petit Machines' is the google translation for the various Blade shinki's little drone thingies. Grabbing it out of curiosity. 175 pages? I hope it's worth it. Agreed. I'd like to at least see it fully scanned before I opt in or out of buying it. And it's sent. Given I choose SAL as shipping, expect to get an opinion on the book in 2 weeks. Archives get! Each Shinki (or most) takes two pages, contains BM MK II stuff, has cradles info, and shows Shinki BM MK II expression (LOL @ Renges!). I'll review it on Monday or Tuesday because I got a semi-decent Anime convention I'm currently attending. Last edited by ArcticKitsune on Fri Nov 18, 2011 9:17 pm, edited 1 time in total.